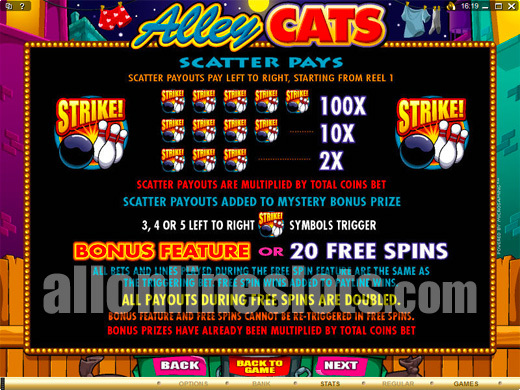 Alley Cats is a Microgaming slot machine with a bowling theme. The game uses the 5 ree, 9 line format and has a top jackpot of 10,000 coins. You can also win 20 free spins with all wins doubled and a bowling bonus with instant prizes. 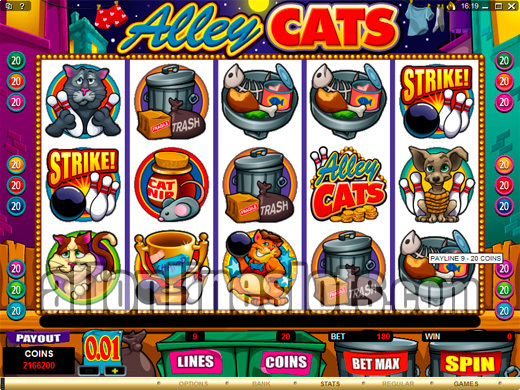 Alley Cats is a 5 reel, 9 line slot machine with a random bonus feature of either free spins or a pick a box style bonus. It has a bowling theme mixed with cats which is a nice play on words. You can bet between 1 and 20 coins per line so max bet is 180 coins. Coin size range between 1c and 25c. 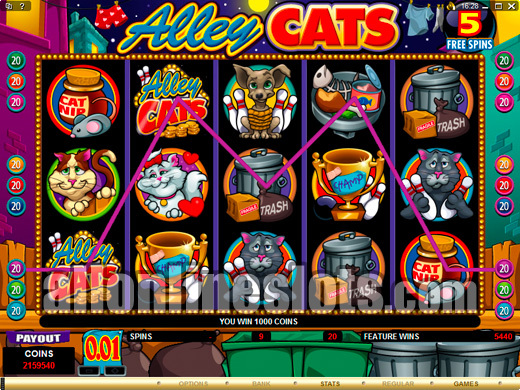 Top jackpot on Alley Cats is 10,000 coins for five Alley Cats logos on any active line. This win is of course multiplied by your line bet of up to 20 coins so the top jackpot during normal play is 200,000 coins at maximum bet. Second highest pay is 5000 coins for five bow tie cats. There is no wild symbol on Alley Cats. There is one winning combination that sticks out as being a bit different. Any combination of Alley Cats logos and the second highest paying bow tie cats pays between 30 and 500 coins. Third highest pay is 2000 coins for five trophy symbols. The Strike symbols are scatter pays although they only pay when aligned left to right. Three or more of the Strike symbols activates the bonus game. There are two possibilities for the bonus. You either win free games or a shot at the bowling alley bonus. If you win the free spins you get 20 free games with all wins doubled. The free spins cannot be re-triggered and the bowling bonus cannot be won during the free spins. The second bonus is the bowling bonus. Here you move on to a second screen game where you have a back alley bowling lane (Screenshot). You get three bowls. Simply pick a target and the cat bowls the target over. You then win a instant prize which is a multiple of your triggering bet. Once you have had three shots your total is added and the bonus ends. 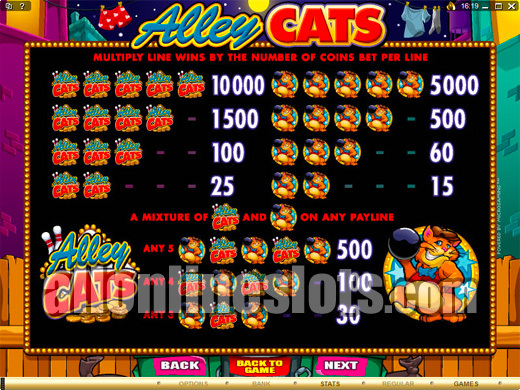 Alley Cats is a good quality nine line slot with a bonus style that you will either love or hate. If you are a die hard free spins fan then it might not be the game for you as you never know if you will actually get the free spins or the bowling bonus. Still in some ways this adds to the fun.